Home | JUST IN | SHOWBIZ | Tania Omotayo & Tiwa Savage Beefing Over Wizkid? Here’s What We Know. 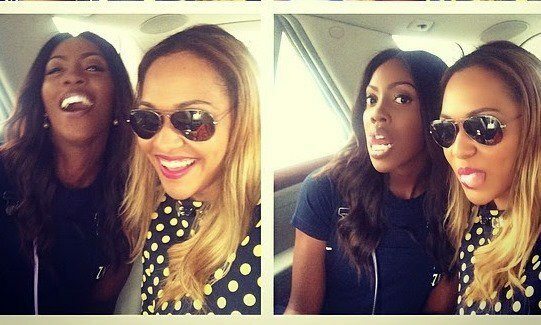 Tania Omotayo & Tiwa Savage Beefing Over Wizkid? Here’s What We Know. Amidst the rumor that Starboy CEO, Wizkid and Africa’s finest diva, Tiwa Savage are romantically involved, the former’s ex, Tania has unfollowed Tiwa Savage on Instagram. Wizkid and Tania were on-off lovers for about 3 years before they finally split in 2014. Now with the pictures and videos of Wizkid & Tiwa Savage surfacing online and fueling suspicion that the king and queen of Afrobeats might be involved beyond just making music, sources have outed Tania’s action of unfollowing Tiwa Savage over this dramatic Wizkid situation. Already eyebrows are being raised on how much time Wizkid seems to be spending around Tiwa Savage. Just recently, the duo were spotted on many believed to be a lunch date somewhere in Lagos Island. Although both of them are yet to confirm or refute this rumour, Tiwa & Wizkid are obviously enjoying the solace of each other, and this can be evidenced from their time lots spent on private jet trips and on performing rounds for music events.